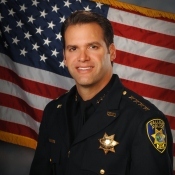 Chief Andrew Bidou served 26 years in policing before becoming Chief of the Vallejo Police Department in 2014. He rose from the ranks of Officer to Captain with the Newark Police Department prior to serving as Chief with the Benicia Police Department. -	Fitness program where employees can substitute meal break to workout on duty, reducing workman’s compensation claims by over 25%. Chief Bidou hold s Bachelor of Arts in Management from Saint Mary's College and a Master of Public Administration from Golden Gate University. He is a graduate of the Senior Management Institute for Police held at Boston University, the FBI National Academy, and completed the Senior Executives in State and Local Government program held at John F. Kennedy School of Government, Harvard University. He belongs to International Association of Chiefs of Police, the California Police Chiefs Association, and serves an Executive Fellow for the Police Foundation in Washington D.C.